A few days ago, I wrote about the dental and medical distributor Henry Schein (HSIC). I included Henry Schein in my series “Preparing for the end of the cycle” as I would call Henry Schein a wide-moat company. And as Patterson Companies (PDCO) is operating basically in the same industry – both companies are operating in the dental distribution market and until the spin-off in February 2019, Henry Schein was also operating in the animal health sector – we have to question if Patterson Companies has a similar wide moat. In the following article, we will take a deeper look at Patterson Companies to find out why the company seems to be much more in trouble than Henry Schein. The business model of Patterson Companies seems very similar to Henry Schein and both are operating in the highly concentrated dental distribution market where the two companies and Banco Dental Supply together have a market share of 85%. Operating in a concentrated market often leads to higher levels of profitability and often makes it difficult for new competitors to enter the market. However, Patterson Companies seems to be missing any form of pricing power, which is common in a concentrated industry. In the following section, we are looking at different numbers and try to analyze why Patterson Companies is underperforming right now. When we look at the company’s revenue, we can see that Patterson Companies was able to increase revenue constantly, and only in the last three years, revenue stagnated. Over the last ten years, revenue increased by about 6.5% annually which is a very solid growth rate. The problem is earnings per share which could increase 2.8% annually but are showing a rather mixed picture (and declined in the last four quarters to a trailing 12 months EPS of $0.83). 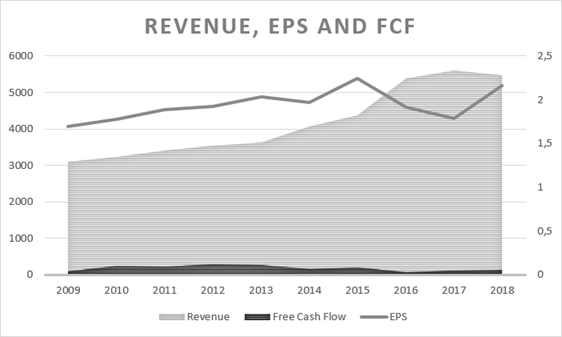 Aside from the EPS, the free cash flow is also showing a very mixed picture and declined for several consecutive years in the recent past – in 2012, free cash flow was as high as $292 million, but in 2018, FCF was only $136 million. One problem is the fact that Patterson Companies is moving away from being a dental distributor and is focusing more on animal health. In 2018, 59% of total sales stemmed from animal health and only 41% from dental. It might be true that the animal health sector is providing growth opportunities for Patterson Companies (as the dental sector is facing some headwinds in the recent past), and in 2015, Patterson more than doubled the sales of the animal health business as a consequence of the acquisition of Animal Health International for $1.1 billion. But, in the last three years, overall revenue stagnated, and since 2016, revenue is without a clear uptrend. While revenue from animal health continued to increase in the last few years, the dental segment declined from $2,476 million in 2016 to $2,196 million in 2018. It may be true that the animal health business is providing growth opportunities, but Patterson Companies is also moving away from the highly profitable dental business to a lower-margin business and is also jeopardizing the moat it once had. Henry Schein made the same “mistake” and moved into the animal health segment but is now focusing again on its dental business by spinning-off the animal health business unit (which is a smart move in my opinion). It is not enough to grow revenue (which also seemed to be a problem for Patterson in the last quarters), the company also has to transform revenue growth into higher earnings per share and a higher cash flow. A big problem for Patterson Companies is its margins, which show a clear downward trend over the past decade. Gross margin was declining from 33.7% in 2009 to 21.9% in 2018 and operating margin was literally cut in half – from 11.2% in 2009 to 4.0% in 2018. In the last four quarters, operating margin was only 2.4%. If operating margin would decline because the company is investing heavily in research and development or in marketing and advertising, it could make sense as these efforts could lead to growth and higher profitability in the longer term. But operating expenses (as a percentage of total revenue) were decreasing in the last few years. While the dental business generated an operating income of $229 million out of $2.2 billion in revenue, the animal health business generated only $78 million in operating income despite $3.2 billion in sales. But it is important to point out that overall operating margin is not only declining because Patterson is moving more and more into the low margin animal health business. Operating margin also declined in the high-margin dental business. The problem for Patterson Companies is the increasing cost of revenue. From 2014 till 2018, revenue increased from $3,585 million to $5,465 million while the cost of sales also increased from $2,566 million in 2014 to $4,266 million. Cost of revenue increased from 70.5% of sales to 78% of sales which led to a declining gross margin – from 29.5% in 2014 to 21.9% in 2018. The constantly declining gross margin is a strong hint that Patterson Companies is missing pricing power and is “buying” the higher revenue with lower profitability. Henry Schein – in comparison – could keep its gross margin very stable despite operating in similar market segments. When looking at the data of the last five quarters, it seems at least like the company could stabilize the gross margin right now and after the operating margin hit its low point in the reported numbers from July 2018, the margin could be increased again in the last two quarters. When looking at the company’s return and especially on return on invested capital, we see a ROIC which is fluctuating about 10% with an average of 9.87% over the last decade (8.08% was the low point in 2017). That’s not exceptionally good, but we are certainly looking at decent numbers. 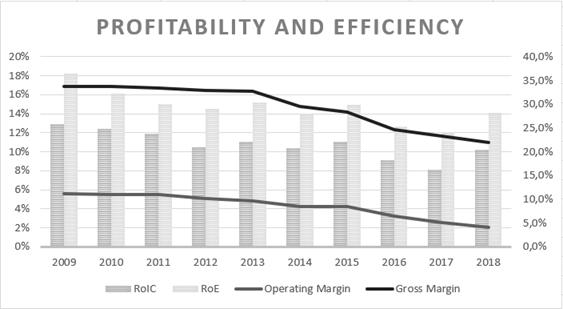 A little troubling is the negative trend as the ROIC was constantly declining from 2009 till 2017, and only in 2018, Patterson Companies was able to increase ROIC once again (and might have found the bottom). When looking at the company’s balance sheet, we probably won’t be excited, but there is no reason to be concerned either. Currently, the company has about $733 million in long-term debt on its balance sheet and about $22 million in short-term debt. This leads to a D/E ratio of 0.51 and when comparing the number to last year’s operating income ($220 million), it would take about three and a half years to repay the outstanding debt. Both numbers are acceptable – especially as Patterson Companies has $117 million in cash and cash equivalents on its balance sheet to absorb short-term financial problems. And almost all of Patterson’s debt is not due before 2022, which gives the company some time to manage the turnaround and make the company more profitable again. Additionally, the company doesn’t have to be concerned with the debt levels and think about problems that could arise from high debt levels in combination with an upcoming economic cooldown (or recession). In the recent past, Patterson Companies also changed two important positions in the management team. In November 2017, Mark Walchirk was appointed as new CEO and joined the company after being with McKesson before (as President of US Pharmaceuticals) and also spent 13 years in distribution at Baxter. In June 2018, Don Zurbay – who was working with St. Jude Medical before – joined the company as new CFO. With two new important members in the management team, Patterson Companies might have reached a turning point, and as I am certainly no supporter of short-term thinking and acting based on financial results from one single quarter, I would give the new management team a little more time before we judge if they are able to turn the company around. Aside from all the negative aspects about Patterson Companies that suggest the company doesn’t have a wide moat, we also have to mention the dividend and the share buybacks. Currently, Patterson Companies is paying a quarterly dividend of $0.26 which is resulting in a dividend yield of almost 5%. Since 2010 – when the company started paying a dividend – it could increase the annual payments every single year, but in the recent past, dividend growth slowed down a little and for the last eight quarters, the company could keep the dividend only stable. 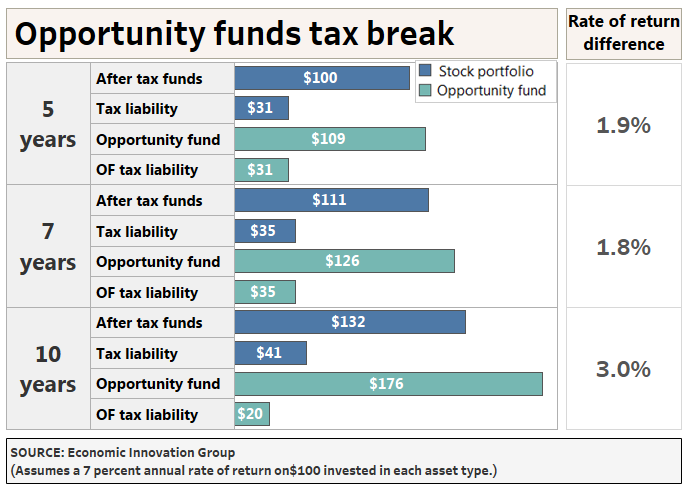 When taking the earnings per share from 2018, the payout ratio is about 40% which seems to be an acceptable ratio. But when we take the trailing EPS of the last twelve months, we get an EPS of only $0.83 and a payout ratio above 100% which cannot be sustainable. Additionally, Patterson Companies could bring the number of outstanding shares down from 119 million in 2010 to 93 million right now. The dividend, as well as the share buyback programs, is showing that the company obviously is generating enough cash to distribute a larger portion of it to its investors. These are positive aspects, but certainly not enough to assume that the company has a wide moat. Especially, as we have to be cautious if the dividend is sustainable. I don’t think that Patterson Companies has to cut the dividend right away (the expected adjusted earnings per share for 2019 are $1.40), but I wouldn’t bet on a stable dividend either. For a dividend investor, Patterson Companies could be a good pick as it has a high dividend yield, but considering aspects like dividend growth and stability of dividend, there might be better companies in the market. Patterson Companies has lost its moat in the last few years, but missing levels of defensibility against competitors doesn’t automatically mean that the stock is a bad investment. And it definitely doesn’t mean one can’t generate high returns by investing in these companies. The decisive problem for long-term investors is the much higher levels of uncertainty and while it is impossible to know the prospective free cash flows for any company, a wide moat and high levels of defensibility add at least some predictability for future cash flows. Without a wide moat and defensibility against competitors, a company might also perform excellently over several years (and grow at extremely high rates), but it also could change very quickly. Increasing profitability and growing margins are a possible scenario for Patterson Companies, but right now, investors have to deal with high levels of uncertainty surrounding the company as well as the fact that Patterson Companies probably lost its moat and will have to accept lower margins (and probably also missing pricing power). Although the company might be able to surprise with high growth rates in the years to come, we have no facts to support that hypothesis and should, therefore, not use high growth rates for our intrinsic value calculation. As Patterson Companies’ free cash flow is showing no clear trend, I will use the average free cash flow of the last decade ($180.7 million) as basis for my calculation. Considering all the aspects mentioned above, I will use 3% as growth rate for the next few years and also for perpetuity. This leads to an intrinsic value of $27.65 for Patterson Companies (10% discount rate) and is only allowing one conclusion: the stock is undervalued. The numbers I used for my calculation might also be too conservative and Patterson Companies could surprise despite the missing moat. When looking at the different numbers and facts presented above, Patterson Companies seems to have lost its economic moat it once had. Patterson Companies is operating in a concentrated market and is a dominant player, but the declining margins (especially gross margin) show that the company obviously has no pricing power. And while the company is still able to decrease the number of outstanding shares and is paying a rather high dividend, free cash flow is showing that management has problems to generate similar amounts of FCF as in the years before. While ROIC is still solid, the number also declined constantly during the last decade (with 2018 being an exception). And although the animal health business might provide long-term growth opportunities, companies also have to be able to defend the market share against new competitors because otherwise, companies will enter those sectors that provide high levels of growth. Nevertheless, Patterson Companies seems to be undervalued right now and could be a good pick for an investor – especially for dividend investors. Aside from the dividend, which is an aspect that speaks for Patterson Companies, Henry Schein would probably be the better company to invest in. Henry Schein is also facing price pressures and is confronted with a challenging dental market right now. But Henry Schein seems to handle the troubles much better than Patterson Companies, which is indicating that Henry Schein is having a competitive advantage while Patterson Companies probably weakened the wide moat it once had.